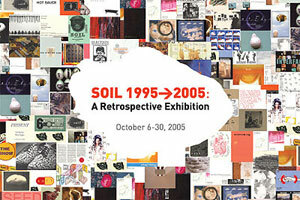 Way back in 1995, I was briefly affiliated with the SOIL artist cooperative in Seattle, WA. Now, 10 years later, they are having a retrospective exhibit, in which I will be showing two new paintings. Meanwhile, the show runs through October 30, with the opening reception occurring this Thursday, October 6. SOIL is at 112 3rd Ave. South in the Tashiro Kaplan Building in Pioneer Square, Seattle, WA. See ya there!